This group is a social training group for and by members of the Fresno Cycling Club, that promotes SAFETY FIRST. We embrace and hold as our core value, the concept of Family. The ride group was founded in July of 2013 and continues to flourish today as a subsidiary ride group of the FCC. We have over 200 members. The Killer Bees are a transitional/training ride group. We welcome new "B" riders into the group, train them in the ways and means of cycling in an effort to prepare them for a higher riding category. From time to time the ride leaders, with input from other group members will put together a list of organized event rides that we wish to participate in and will start a training series geared to prepare our riders for that goal. We generally follow the formula of adding either 10% of miles from the previous training ride to the next one, or 5 miles. We endorse and participate in local Bike Shop rides as well as rides and events posted in the FCC Calendar by other FCC Ride Groups. 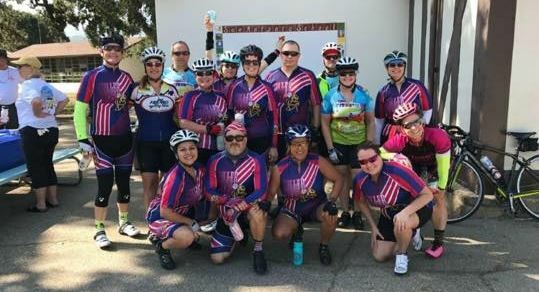 We also create our own events and rides throughout the year away from Fresno, such as rides on the American River Bike Trail and rides on the Coast. We tend to set a fast pace for our rides within the "B" classification. This is very important for a new member to understand. Our target speed is to achieve a 14.5-15.5 MPH post ride average. This may start to touch on the "C" classification, but that is one of the goals of this ride group. To help the rider transition to the higher classification. The rider should learn and become comfortable riding as a group, and especially in a pace line and not be afraid to "pay their dues" by pulling the group when it's their turn. We do tend to take longer breaks and regroup more often than what may be considered "normal" for a "B" group. We do this to allow riders who may have fallen off to catch up, hydrate or refuel and for participants to tend to any special medical issues (i.e. monitoring blood sugar). All ride participants must conform to the Fresno Cycling Club rules and regulations regarding Rides. Helmet, water bottles, a bike in proper working order, lights when riding at dusk or beyond, the equipment and ability to change your own tire, just to list a few.